The Baroque ensemble Belladonna was founded in St. Paul, Minnesota in 1993, and has since performed in festivals and music series around the globe. The group was featured on National Public Radio’s Performance Today, Pittsburgh’s WQED-FM classical music station, WGBH Boston, as well as the nationally syndicated radio program Harmonia. Series performances have included appearances at Seattle Early Music Guild, National Music Museum (Vermillion S.D. ), the Renaissance and Baroque Society (Pittsburgh), and Early Music Now (Milwaukee), then made their New York debut in Merkin Hall. Their critically acclaimed Folias Festivas CD was re-released on the Dorian label. 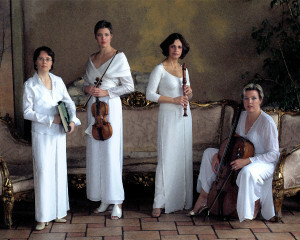 The quartet, which features Barbara Weiss, harpsichord, Cléa Galhano, recorder, Margaret Humphrey, baroque violin and Rebecca Humphrey, baroque cello, has received wide recognition for their exciting interpretation of familiar works and their colorful arrangements of little-known pieces. Belladonna was a 10 year artist-in-residence ensemble for the Schubert Club of St. Paul, and is currently Class Notes Artists in Residence for Minnesota Public Radio, where they present outreach educational programs to children in public schools around the state. Belladonna is presenting new concerts: Love and War in Baroque Musical Oppositions -- see Calendar for more details! Check out Belladonna's new website! Belladonna has received an Early Music America education grant for 2015-2016!